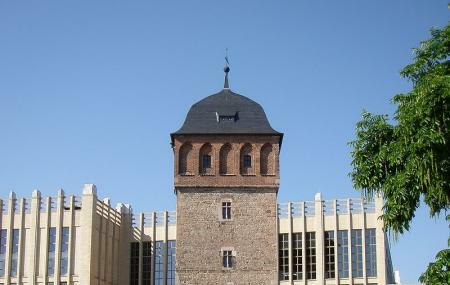 One of the oldest preserved landmarks in the city of Chemnitz, the Red Tower, or the Roter Turm. This tower was built towards the end of the 12th century and was initially used as a residential tower followed by the purpose of self-fortification. The tower owes its name to the red paint of the brick storey that was built in the 16th century and its former red roofs with tiles. Till the 19th century this tower and its annex was used as a prison. It was during the Second World War that this tower was burned down before its reconstruction took place between 1957 and 1959. A climb up this tower offers stunning views of the city of Chemnitz. Located in the city centre, this tower and its museum are surrounded by many walking pavilions, shopping malls and many restaurants and cafes. How popular is Roter Turm? People normally club together Kulturkaufhaus Tietz and Staatliches Museum Für Archäologie Chemnitz while planning their visit to Roter Turm. Good shopping centre. The only problem is the parking, very expensive. Nothing much to it. Just an old tower.